The clinical study presented herein details the diagnosis and treatment of a visual / neurological condition known in Western medicine as nystagmus. This case is presented from both Western and Eastern perspectives. The patient recovers from this disorder with the help of medical qigong treatments, a specialty within Chinese medicine. About the author: Brother / Doctor Bernard Seif, SMC, EdD, NMD is a Catholic monk and a Clinical Psychologist, Board Certified in Behavioral Medicine. He is also a Doctor of Naturopathy specializing in Chinese Medicine with sub-specialties in Medical Qigong and Chinese medicinal herbs. Brother Bernard enjoys doing spiritual direction and giving retreats and workshops in America and abroad. A 35 year old Caucasian male contacted my clinical psychology / Chinese medicine office seeking stress-management training for anxiety related to thoughts of chemical sedation for a scheduled hernia repair surgery. The presenting pair of psychological and medical interventions was dealt with well by the patient and his healthcare providers, and the sedation and related hernia surgery were performed successfully. During the course of my history taking, however, a much more chronic and debilitating condition was revealed. The patient had what Western medicine would refer to as “nystagmus,” a neurological condition sometimes also called “saccades,” which is marked by involuntary movement of the eyeballs and which may be congenital in etiology. The patient was married, had one young daughter, was expecting a second child, and worked as an engineer. A history and (Chinese medicine) physical indicated a patient who was fatigued and suffering from early wakefulness insomnia. He would awaken at about 3 a.m. each morning and be unable to return to sleep after that. More importantly, rapid involuntary bi-lateral movements of the eyes began approximately 6 years prior to our first session. The symptoms were relatively mild at onset and waxed and waned, but after a business trip to Singapore and the stress related to the changes in time zones each way, the nystagmus symptoms became chronic. Eye symptoms were clearly making the work and personal life of this bright, articulate, and well-educated man increasingly difficult. After a little more than one year of dealing with daily nystagmus symptoms, the patient sought the help of a chiropractor whom he trusted. A CAT scan of the brain and brain stem suggested by the chiropractor were both normal. The patient next received a Japanese type of energy treatment incorporating the laying on of hands popular today and known as “Reiki,” with no improvement. The patient next consulted a neurologist and a resulting MRI study of the brain revealed the presence of an Arnold-Chiari deformity. In this condition, the inferior poles of the cerebellar hemispheres and the medulla protrude through the foramen magnum into the spinal canal. The patient was told that he had a “Chiari malformation I” and that this condition commonly causes nystagmus. A surgical intervention was the only treatment offered. The patient declined surgery. This patient initially came to me in my role as a clinical psychologist. During the course of his treatment he learned that I am also Board Certified in Behavioral Medicine and specialize in Chinese medicine, with a sub-specialty in medical qigong. Medical qigong is a part of the 5,000-year-old Chinese medical system, which can employ the use of movement, breathing exercises, and meditation. Further clarification about Chinese medicine and medical qigong will become apparent as the treatment of this patient is described below. The young man asked if I might help him with his nystagmus. I commented that nystagmus is a Western diagnosis but that I would take history and physical from a Chinese perspective and then decide if a Chinese treatment might be helpful. What follows may sound strange to Western ears, especially medical ones. I understand this very well since it was very difficult for me to stop thinking like a Westerner during my Chinese medicine training. The heart of Chinese diagnosis involves the taking of the 12 pulses.1 Each of the pulses relates to a particular meridian, which is viewed as controlling the quality and flow of “qi” or life force to the organ associated with that meridian. The pulses can be taken on the wrist or on the fingertips and toes. Acupuncturists typically use the wrists and medical qigong doctors tend to use the beginning and end of the twelve meridians, i.e., fingers and toes. The internal branch of the Liver meridian runs through the neck and eye, and on to the crown of the head. Each meridian is associated with a particular sense organ and the Liver meridian is associated with the eyes. There are five Elements (movements or organ energies), which make up the web or blueprint of Chinese medicine: Fire, Earth, Air/Metal, Water, and Wood.2 Each Element has 2 meridians associated with it (except for Fire which has 4). The Liver meridian (along with the Gall Bladder meridian) is associated with the Wood Element. The activity of the Liver meridian peaks between 1 a.m. and 3 a.m. in the Chinese system. The patient would awaken about 3 a.m. each morning at the end of peak Liver activity, perhaps needing additional qi flow in the Liver meridian. All of this helped me form my diagnosis and treatment plan for working on the root (Liver meridian stagnation), rather than the branch (eye symptoms). My Chinese diagnosis was “Liver-wind affecting the eyes.” Since the qi flow in the Liver meridian was stagnant and choppy the “Wind” quality was added to the diagnosis. Any organ or imbalance (known as “disorder” in the West) can have a Wind quality to it. Each of the Five Elements mentioned above has an associated “external pathogenic factor” associated with it. Coincidently, the Liver meridian is associated with Wind and Wind symptoms arise rapidly, and move rapidly and in gusts. Twitching, tremors, spasms, Parkinson’s disease, and facial paralysis are all Western examples of Wind disorders. Due to distance and time constraints, the patient met with me monthly. During each session a form of physical manipulation (Chinese medical massage known as Tui na) was performed during which I tonified (stimulated via direct manipulation and hands off the body movements) the liver meridian and cleansed the body of stagnant qi with sweeping movements and intent (known as “mind-will” in the East). The entire process utilizes what would appear to be a Western massage as well as movement on the part of the doctor near but not necessarily touching the body, usually in the area of stagnation or, in this case, the area of the “choppy” qi. The patient was also prescribed a simple form of meditation and movement to be done at home. This “home work” might take only 10 to 20 minutes daily but could be done for longer periods of time if the patient so desired. He also reduced the amount of sugar and meat in his diet and increased his intake of protein. The liver-wind disorder began to improve after our first session. 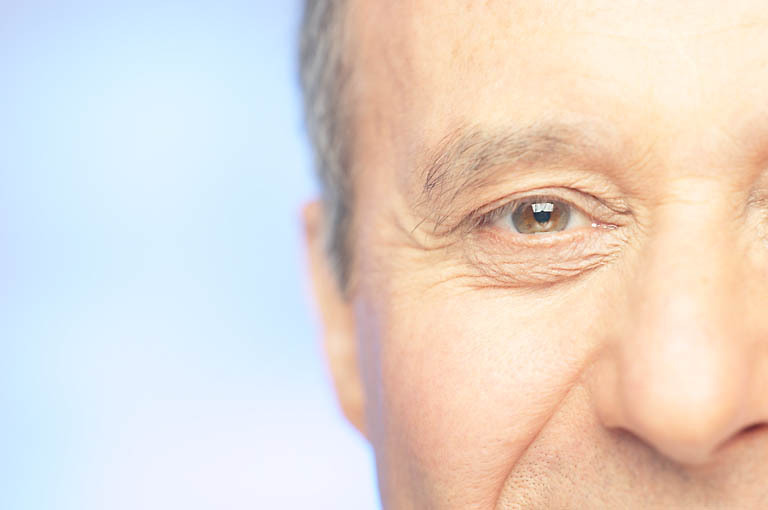 The eye movements were typically spontaneous but could be triggered by a glance to the right. The duration and frequency of spontaneous eye movements and the ability to trigger to movements at home or in my office lessened after each session. After several months of treatment the condition was about 50 per cent improved and plateaued for approximately one month. After that the condition began to improve again to about 75 per cent improvement with another plateau of an additional month. Finally the condition was completely eliminated. The course of treatment was approximately 2 1/2 years for complete elimination of liver-wind disorder / nystagmus symptoms. The patient has remained symptom free for more than one year at this writing. Brother / Doctor Bernard Seif, SMC, EdD, IABMCP is a Catholic monk, clinical psychologist, Board Certified in Behavioral Medicine, IABMCP, Chinese medicine specialist, and medical qigong sub-specialist. He is in private clinical practice and gives workshops and retreats throughout the United States and abroad. Corresponding Author and Reprints: Brother / Doctor Bernard Seif, SMC, EdD, IABMCP, HC 1, Box 455, Frantz Road, Brodheadsville PA 18322-9630 (e-mail: monk@epix.net). Acknowledgement: My thanks to the patient on whom this report is based for the honor of permitting me to treat him. The use of his notes, along with mine, made writing this report much easier. The yellow emperor’s classic of internal medicine. 1972, University of California Press, Berkeley, CA. 1997, Ballantine Books, NY, NY. Updated periodically, Qigong Institute, Menlo Park, CA.